CabWriter Comprehensive Kitchen in Face Frame Style and NW Perspective View. CabWriter is equally capable of drawing pure frameless or hybrid designs as face frame designs. The latter was used in the nine part CabWriter Comprehensive tutorial series. Compare the image at right to the one at left below. They are exactly the same design with one using face frame design style and the other using pure frameless. The difference is all in the CabWriter Settings defaults used to draw the cabinets. If you have viewed the CabWriter Comprehensive videos you know that the base set of defaults are those that come installed in CabWriter and can be re-installed using the Re-Load Factory Settings tool. 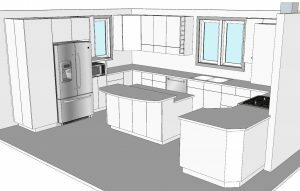 You are also aware that some cabinets are drawn with this base set of defaults but with modifications to some small number of those defaults. The divided base cabinet next to the refrigerator and the divided upper with the wine storage are examples of this as are the spice cabinet to the right of the refrigerator and the microwave cabinet. CabWriter Comprehensive Kitchen in Frameless Style and NW Perspective View. 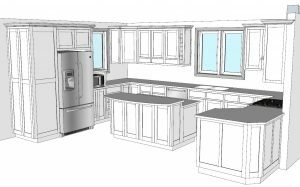 It is quite common for a kitchen design to have a base set of defaults and for many of the cabinets in the design to be constructed with modifications to the base set. In fact, it is entirely possible for every cabinet to have a unique set of defaults. The CabWriter user should become comfortable with modifying defaults and indeed saving defaults to a file which can be retrieved later for use with another cabinet. CabWriter comes with such a file called Frameless for pure frameless designs. Pure frameless designs are those that have no face frame stiles or rails. The image at left is an example. To access the Frameless file use the Open and Load CabWriter Defaults tool which will open a dialog box called Defaults File Selector. Next use the drop down selector to choose Frameless and then click the Load button. I plan to redo the CabWriter Comprehensive series using the same kitchen design shown in the frameless kitchen at left. Over the course of planning for that series I may further modify the Frameless file and hopefully improve it as a base set of defaults for this style of design. Below are links to both models. If you see something in either design you would like covered more fully don’t hesitate to drop me a note. Ans stay tuned for CabWriter Comprehensive Frameless.